Chosen for prestigious medical research internship? Check. Eager and ready for these great opportunities? Nope. Parker’s meticulous life-plan to cure the cancer affecting her twin brother goes way off course during the summer after graduation, as the introvert finds herself in charge of senior citizen pottery painting classes, is amazed by new friend Ruby’s open-heartedness, and just might find a connection with artistic Finn from grade school. Happy book birthday to Letting Go of Gravity ! Have you read Leder’s 2016 novel The Museum of Heartbreak ? I recommended it here. Is it time for you to fly away from expectations? Book info: Letting Go of Gravity / Meg Leder. Simon Pulse, 2018. [author site] [publisher site] Review copy and cover image courtesy of the publisher. My book talk: A decade of hard work and Parker is accepted to Harvard! After twin Charlie was diagnosed with leukemia when they were kids, med school has been her sole goal (especially after last year’s relapse). But she can’t stomach the internship at the hospital where Charlie was treated and finds another summer job at a pottery studio where she reconnects with Finn from elementary school. Her best friend is in Europe for the summer, Charlie is acting so recklessly, and Parker isn’t sure how long she can put off telling her parents about how things have changed. Want to become an illustrator? Ready to step up your drawing style? Elise says “let out all the ideas” in your sketchbook! Monsters and microbes and funny mushrooms are some of the “complete nonsense” that this Quebecoise author/illustrator allows herself to draw in her plain black notebook, only later revising them or adding funny stories or spinning them off into her many books for kids. Enjoy this sample of Elise’s unique creatures and drawing style here, courtesy of the publisher, then visit your local library or independent bookstore to get your own copy. What creatures might your doodling reveal? Book info: If Found, Please Return to Elise Gravel / Elise Gravel, translated by Shira Adriance. Drawn & Quarterly, 2017. [author site] [publisher site] Review copy and cover image courtesy of the publisher. My book talk: Creatures large, small, and all whimsical fill this notebook by Canadian illustrator and children’s author Elise Gravel, as inspiration for us to draw, draw, draw! Draw in spare moments, like Elise does – practice and more practice is the way to improve, as you find your own drawing style. You can imitate illustrations for practice or create crazy ideas and doodles. Some may inspire a story, so write it. Look at her Floofs and foxes, bunnies dressed in punk rock t-shirts, and “the Incredible Hulk presents his favourite recipes for a romantic dinner” – mashing up ideas can make really funny pictures! To become a better illustrator, just grab your notebook (any color, says Elise) and keep on drawing! Fashion is always in flux! I was really pleased to see this informative and fun book as a finalist for the CYBILS Award for Middle-Grade Nonfiction, where I got to read and discuss it as second-round judge this year. Take the Fashion Rebels quiz to see which fashion icon you trend toward, then be your own person! What fashion trend of the past would you like to see today? Book info: Fashion Rebels: Style Icons Who Changed the World Through Fashion / Carlyn Cerniglia Beccia. Aladdin/ Beyond Words, 2016. [author site] [publisher site] Review copy and cover image courtesy of the publisher. My book talk: Fashion trends have signaled rebellion, improved international understanding, and raised parents’ eyebrows for centuries, as this sketch-filled book shows, celebrating Fashion Rebels past and present. Meet queens Cleopatra and Marie Antoinette, artist Frida Kahlo and dancer Jacqueline Baker, along with Audrey Hepburn, Ellen DeGeneres, and many more as you examine essential components of each woman’s style and discover how you can use their inspiration to make your own fashion statement. Filled with accurate histories that sound like the best kind of celebrity gossip, lots of DIY techniques and tips for adding signature fashion elements to your wardrobe, and current fashionistas to watch, every section of Fashion Rebels reminds you to be you! Slow down the pace today, as you craft unique summertime styles for yourself and your home with expert instruction. 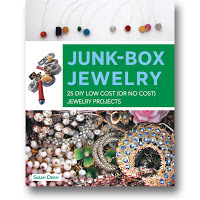 Junk Box Jewelry leads you from tools and materials to finished fashion as you transform found items into unique bracelets, earrings, and necklaces – my recommendation here. Peek into Stitch It Simple (my recommendation here) for patterns that you can adapt to create pillows, wall hangings, and giftables that you’ll be proud to share. What craft books would you suggest for summer? With so much rush-rush and 24/7 connectivity, it’s good to sit back and work with our hands for a while. Choose a time to give yourself permission to slow down and make something special – for yourself or for someone else (hint: Father’s Day is 2 weeks away). 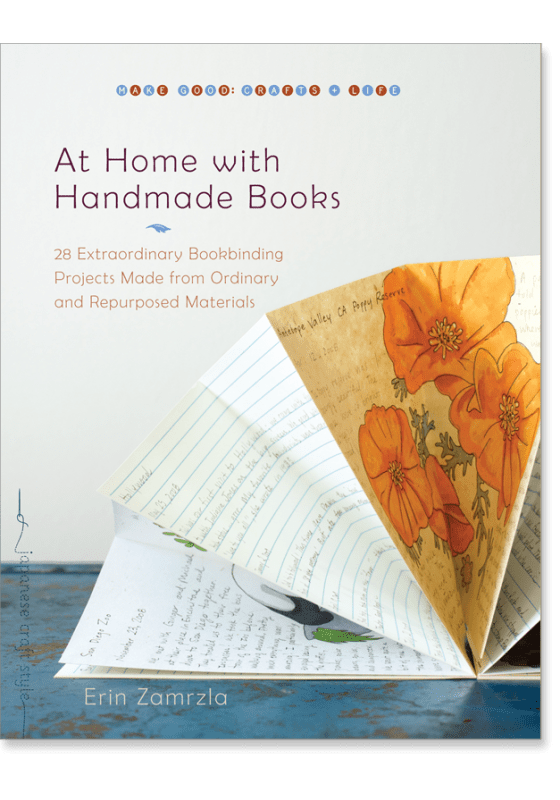 At Home With Handmade Books – think beyond plain white paper as you make books from shipping tags or use postcards as covers. Grab your favorite colors and designs of duct-tape and let your Sticky Fingers craft new accessories and adornments. What crafty creations would you like to try on a slow-down summer day? equals fabulous new home items sewn by you! You will be able to beautifully Stitch It Simple with sharp scissors, fusible interfacing, and the designer’s step-by-step instructions. Choose complementary colors and designs for the Patchwork Chairpad, then finger-knit a cord for the Flower Garland made with its fabric scraps. Beth has free alphabet templates for the pennant bunting here on her website, too. Look for this late 2014 paperback at your local library or independent bookstore so you can be inspired to stitch your own fun home accessories. Which project from the cover would you start with? 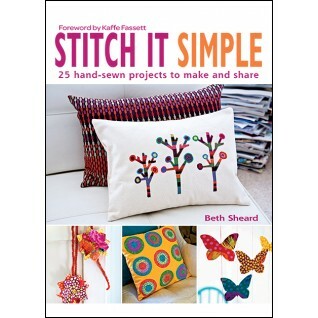 Book info: Stitch It Simple: 25 Hand Sewn Projects to Make and Share / Beth Sheard. Taunton Press, 2014. [author site] [publisher site] Review copy and cover image courtesy of the publisher. My book talk: Colorful designs for pillow covers, wall hangings, aprons – it’s easy to Stitch It Simple and add your own personal touches to your home. After covering the basics of sewing, appliques, and finishing, this young British designer presents patterns and helpful hints for 25 projects to brighten up your bedroom, study, and kitchen. Charming gift ideas include a Butterfly Mobile, Bird Tote Bag, and Kit and Kat stuffed cats which can double as bookends if you add weights before stitching shut. Use the assembly method for the Owl and Pussycat Wall Tidy to create a hanging organizer with your favorite fabrics and colors, echoing what you chose for the Balloon Cushion or Tree Pillow Cover (small or large). 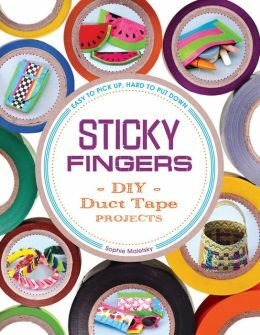 Sticky Fingers, by Sophie Maletsky (book review) – duct tape DIY projects for all! Duct tape in colors and patterns… check. Great instructions for clever, creative items… get Sticky Fingers! No, not your own fingers, but this step-by-step book of DIY (do it yourself) duct tape projects from craft blogger Sophie Maletsky. Yes, there are the usual duct tape wallets and cute flowers to top your pencils, but you’ll also find clear instructions for an Earring Tree (I like the plastic dinosaur that she added), Spike Bracelet, and Smartphone Case with felt lining. Summer boredom doesn’t stand a chance when you use your favorite duct tape with this “Easy to Pick Up, Hard to Put Down” book scheduled for July 1, 2014 publication – don’t miss the ideas for using up every teensy bit of those pricy patterned tape rolls. Book info: Sticky Fingers: DIY Duct Tape Projects – Easy to Pick Up, Hard to Put Down / Sophie Maletsky. Zest Books, 2014. 240 pg paperback. [author site] [publisher site] Review copy and cover image courtesy of the publisher via NetGalley. My book talk: Ah, so many colors and patterns of duct tape – and now Sticky Fingers collects the techniques and project ideas to make you a duct tape DIY whiz! With just a few rolls of duct tape, proper work surface (many choices) and non-stick scissors, you can create durable items large and small, from the Support-Your-Cause Pin to Messenger Bag. Your own color combo for the Woven Basket can take it from egg hunts to dresser organization, while the Pencil Case you make with duct tape will outlast any bought from the school supply store. Of course, there are instructions for making Flowers, Neckties, and Bow Ties, so you’ll have all the corsages, boutonnieres, and neckwear needed for formal occasions. Get gifty with the roll-and-go Checkerboard, Watermelon Purse, or Checkbook Keeper – the felt-lined Sunglasses Case is a great present, too. Death for sharing the secrets. The all-powerful Doge did indeed control Venice with an iron fist during its heyday as a world trading center. Imagine how he’d respond to intelligent birds who could soar out of his reach, at the behest of their human partners! Pick up this intriguing window into the world of medieval glassblowing, family bonds, and criminal skullduggery today at your local library or independent bookstore – and wonder if the Bird Children’s descendants may still live among us! 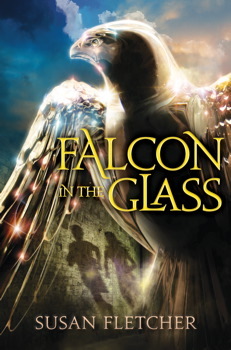 Book info: Falcon in the Glass / Susan Fletcher. Margaret K. McElderry Books, 2013. [author site] [publisher site] Review copy and cover image courtesy of the publisher. My book talk: Without help, Renzo cannot practice his glassblowing for the test. Without help, the refugee children and their birds will freeze. Without fail, the Doge of Venice will have them all killed if he finds them together in his city! As the lowest helper in the padrone’s glassworks, twelve-year-old Renzo wishes he was still working with his father in their studio, before Papa was murdered and Uncle fled Venice with his glassblower’s knowledge and a price upon his head. Now Renzo must demonstrate to the Guild that he can work glass like his father or he will never become an apprentice. Practicing late at night, Renzo spies a starving girl huddled in the studio’s warmth and her falcon in the rafters – no spies allowed in the glassworks, no strangers, no birds! If she is one of the green-eyed Bird Children who were banished from mainland Venice for witchcraft…but he needs another set of hands to work the glass and she needs only a place to rest. With Letta’s help, he can create beautiful glass pieces, including a falcon that looks like it could fly. But the other Bird Children need warmth and food, too. Perhaps they can stay for a little while, even if their silent communication with their birds makes Renzo nervous. But sometimes, doing good carries a heavy price. The ruler of Venice is intent upon capturing the Bird Children, a man who looks like Uncle is spotted on the island, and Mama worries about Renzo’s late nights at the glass furnace. Can Renzo keep the Bird Children safe and out of sight? Can he ignore the whispers about his uncle and criminal mischief? Can he keep his hands steady on the glass pipe when the Guild test comes? Let’s get this all straight: Will is a teen girl (full name Wilhemina), Whit is Hurricane Whitney striking inland Virginia, and this great graphic novel has heart written all over its black and white pages. A shrink would make much of Will’s creation of lamps from found objects in relation to her fear of dark, but I think her creative heart would lead her to do it anyway. She and her friends won’t let a little thing like a hurricane and no electricity stop them from putting on quite an arts carnival to end their summer. Take a peek into Will’s life with the book trailer (you know, like a movie trailer -except for a book) – gotta love Laura Lee’s art! Have you ever faced your fears like Will wants to do? 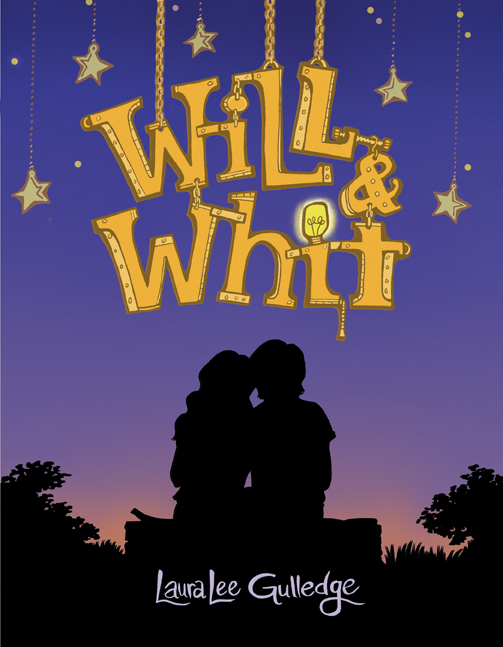 Book info: Will & Whit / story and art by Laura Lee Gulledge. Amulet Books, 2013. [author site] [publisher site] [book trailer] Review copy and cover image courtesy of the publisher. My book talk: As a hurricane approaches, Will confronts her new fear of the dark as she finds ways to move forward with her life through friends old and new. Just a few more weeks of summer before their junior year of high school, so Wilhemina and her pals float along the river on air mattresses, check out the kids across town planning an arts carnival, and hope that Hurricane Whitney won’t really get this far inland. Will makes lamps from interesting found materials, Autumn loves creating puppets, Noel is the best cook ever. The late-season storm does hit their Virginia hometown, knocking out the power for days. She and her aunt are fine in the family antique store, but now Will has even more dark places to avoid as she tries to not-think about what happened to her a year ago. Ava and Blake have worked on their arts carnival all summer – now the continuing blackout may prevent them from actually having the show. Can Will, Autumn, and Noel help the show go on? Is there some special chemistry brewing between the two groups of friends? When will she face what happened last summer?